The PRIDE Stores | Not your typical convenience store! © 2016 The PRIDE. All Rights Reserved. We've been proudly serving Chicagoland for over 30 years. We started calling our stores "The PRIDE" to emphasize the fact we take great PRIDE in the stations we own. Our goal is to provide a friendly and positive experience every time customers visit our stores by starting with a smile and ending with a thank you along with having a warm and open store for everyone to enjoy. The PRIDE stores are owned and operated by The PRIDE Stores, Inc. which is the Retail Division of Parent Petroleum Co. Parent Petroleum specializes in service and sales of petroleum products to retail, commercial and industrial customers throughout Illinois and the Tri-State area with their home office in St. Charles, IL. Discover Beer and Wine Plus Spirits — a boutique store offering an expanded selection of signature brands of craft beer, wine and spirits. 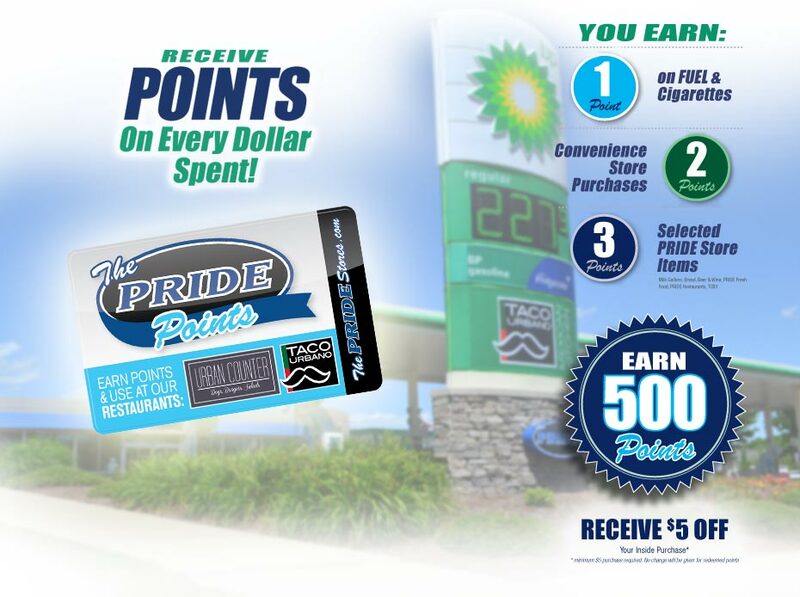 Pick up your PRIDE Points card the next time you visit a PRIDE location near you and start saving! With the card we will seamlessly keep track of your purchase points, club freebies, and much more. Once you register your card online, you can enter your phone number at the pump to collect points on every purchase. Then turn in your points for money off your bill at any PRIDE, Urban Counter, or Taco Urbano location! Click to register your card or for more details. We're looking for Friendly People who enjoy working with the public in a fast-paced environment and have a desire for career growth within a dynamic organization. then The PRIDE has an opportunity for you! The PRIDE Stores created these restaurants because at the PRIDE we prove GREAT FOOD can be made anywhere, even inside a Gas Station. WE OFFER CATERING! Click to download our menu.